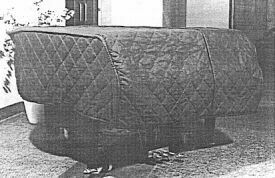 Water Resistant- Black Quilted Covers extra heavy fabric for Upright & Grand Pianos excellent if your piano is in a heavy traffic area. Perfect for Theaters, Studios, Universities, Hotels, Rehearsal Halls, Schools etc. Constructed of superior Heavy Duty Nylon with a polyester filling and flannel lined to protect the surface of your piano. Quilted in 4" squares with a strong nylon thread for superior stitching. We can also make the length of your cover to go to the floor. Custom Made $130.00 extra. Please Note: Due to the seams in the quilting, this cover is Water Repellent, but not completely waterproof. To completely Waterproof the cover, place Visqueen or some other form of heavy vapour barrier poly sheeting, loosely ON TOP of the cover. The straps are attached to the bottom of the cover. You then put a lock through the 'D' rings where they meet underneath the piano. Used for protection in a commercial setting. Make, model and piano size required for Grand Pianos. 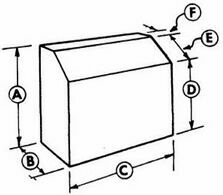 Piano HeightAfter selecting the height of your piano in the drop down box below...please type in the dimensions as shown in the diagram below, and also the manufacturer's name and the model number if you have it. I helped The Webb School Head of Fine Arts with purchasing a piano cover for our upright Steinway. Vanda King's was by far the lowest priced piano covers. Within a couple of weeks, we received our commercial grade heavy padded nylon piano cover and it looks gorgeous. 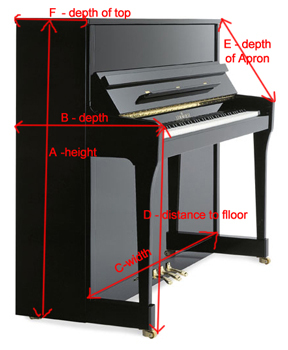 The measurement guide was extremely helpful in getting the piano cover to fit perfectly. This is a high quality piano cover! This cover is very sturdy and fit the piano perfectly. The piano I needed it for is in a student gathering house on a college campus, so lots of foot traffic, parties/events for part of the year and sitting unused for the other part of the year. This cover will work mainly to keep dust out, but also to deter people from setting drinks on it. Quilting was very nicely sewn. I am simply delighted with this cover - it is high quality and will keep the piano in great shape despite it's location in the church hall! The cover fits and looks great. Our music teacher is really pleased. Thanks again. Another great purchase with Piano Showcase. Easy ordering, quick delivery and excellent quality.